This is the perfect way for those who do not like beans to enjoy it. I can tell you that yours truly does not like beans yet, I can never get enough of Ewa Agoyin. I don't know what it is about it that makes it taste so good. Maybe it is the caramelized onions. All I know is that I enjoy eating it. Soak the beans in cold water for 5 hours. Boil the beans for 5 minutes and discard the water. Rinse the beans in cold water and set aside. This soaking and pre-cooking process will help reduce the gas inducing elements. For more on that visit: How to Reduce Beans Bloating. Chop the onions, grind the crayfish and pound the pepper. Blend the tomatoes and boil the tomato puree till all the water has dried from it. Pre-cook the diced onions without any added water. The aim is to get it to caramelize a bit so that it will take less time to fully caramelize during frying. Cook the beans till done. For Ewa Agoyin, the beans needs to be very soft. Note: If you have a pressure cooker, beans is one of the staple foods you will want to use it for. It considerably reduces the cooking time. When the beans is done, add salt, leave to dry up all the water and set aside. To keep the smoke to a minimum and still have the traditional taste of Ewa Agoyin, I use vegetable oil and when it is very hot, I add a small amount of palm oil. Watch the video below to see how I do that. Now add the precooked onions and stir continuously till the onions is fully caramelized. It should be very dark in colour. Add the parboiled tomato puree and stir continuously till you cannot tell the difference between the tomatoes and onions. Add the pepper, crayfish, stock cubes and salt to taste. You can also add a little water at this point if your want. Stir very well and bring to the boil. The Ewa Agoyin is ready! 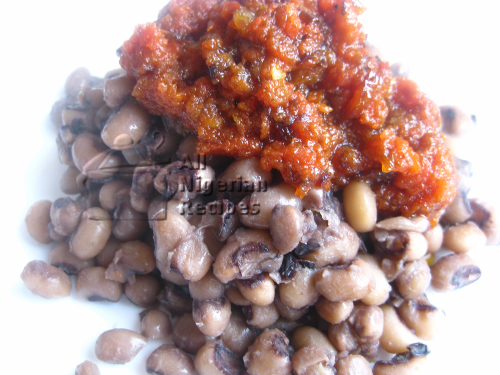 Serve by dishing the beans into a plate and scoop some Agoyin stew on it. 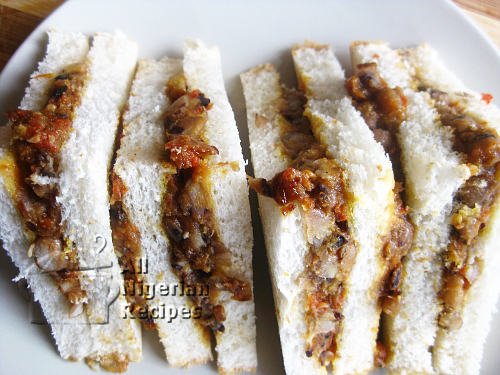 Ewa Agoyin can be eaten on its own, with soft and stretchy bread (known as Ewa ati Bread) or with Fried Plantains.